This tutorial shows how to perform stratified data sampling in Excel using the XLSTAT statistical software. 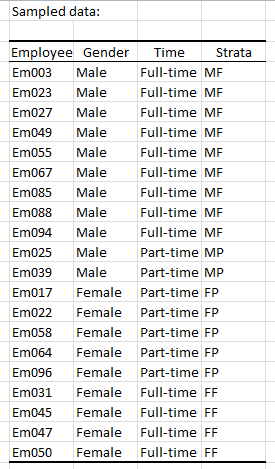 The dataset used in this tutorial is the list of the employee of a company with some details about their gender (male/female) and their type of employment (full-time/part-time). The HR team wants to conduct a survey on the working condition that will be representative of the general opinion without interviewing every employee. They decide to conduct a stratified sampling. There are 46% of female employee and 54% of male employee. 66% of the employee work full-time. The part-time employees are more often female than male; female part-time employees represent 25% of the employees against 9% for the male part-time employee. Open the Data sampling dialog box by selecting the corresponding option in the menu Preparing data – Data sampling. Select the data including all the available columns (employee, gender, time, strata). Choose the sampling option Random stratified (2). This option takes into account the proportions of each strata. We want to generate a sample of 20 employees for the interviews. So enter “20” in the field Sample size. Select the “strata” as the last column of the dataset. The names of the variables are included in the selection so the option variable labels must be ticked. We do not need to shuffle the individuals so we do not activate the option shuffle. When everything is set, press OK.
10% for the 9% of part-time male employees.